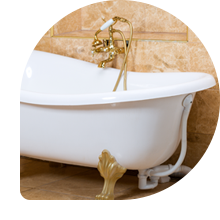 Modern bathtubs and showers can be made from a myriad of materials ranging from the conventional enameled cast iron and steel to fiberglass, acrylic, and man-made materials such as cultured marble. Many one-piece tub or tub and shower combination units are made from gel coated fiberglass or acrylic plastic. Never use abrasives on any of these materials. They can cause scratches to the surface. Usually, they will clean with hot water and soap. If that is not sufficient, a cleaning product recommended by the manufacturer of the fixture, or your plumber, can be used to handle heavier cleaning tasks. Special non-abrasive polishes are available to protect the finishes of fiberglass and acrylic units. The Polishes seal the material's pores, making subsequent cleaning easier. Choose a product recommended by the manufacturer. When decorating the bathroom or repairing something near the bathtub, place a heavy cloth over every inch of the bathtub surface so paint, falling tools, etc. will not mar or chip the surface. Do not stand in the bathtub with shoes, as the nails and grit in the soles can scratch the surface.